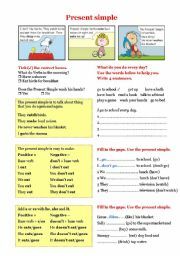 Grammar worksheets > Verbs > Verb tenses > Simple present > GREAT PRESENT SIMPLE SET! 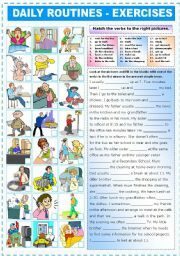 - 5 pages: GRAMMAR-GUIDE + 4 pages of DIFFERENT EXERCISES! 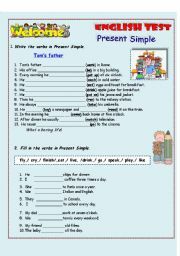 This is a great Present Simple set which includes 5 pages: the 1st page - the presentation of present simple and a short grammar guide, other 4 pages of this set - are different exercises including spelling practice, positive, negative structures and 2 pages of questions practice.Hope it will be useful! 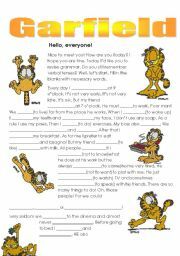 Dear colleagues!I know that the topic of Present Simple is not very original and there are a lot of wonderful wss with Garfield here! But the more worksheets we have on this topic the more we need! This is my personal opinion. 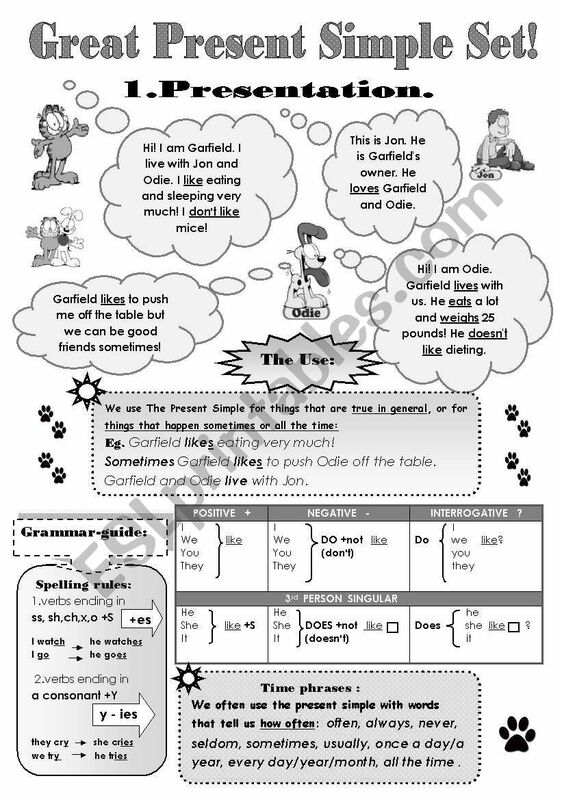 I have created this set for one of my students who is absolutely mad about Garfield! 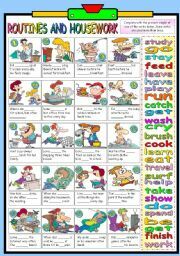 I hope it will be useful for your kids too. You can print each page of this set separately according to your needs.Thanks for downloading my works and leaving your comments! It is always useful. 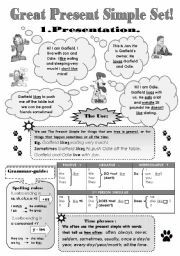 Great B&W worksheet! Thanks a lot. Keep sharing!! 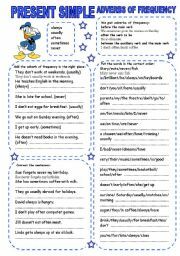 Excellent gorgeous worksheet!!! Very complete and really useful!! Thanks so much again!!! Creative and very complete!Great work! It coulsn´t be done better. Thanks a lot!!! And more because it´s B&W!!! Absolutely wonderful work! I am teaching this tense to my grade 7 class and they need a new, more exciting approach and I think that I´ve just found it! Thank you for your excellent worksheet. 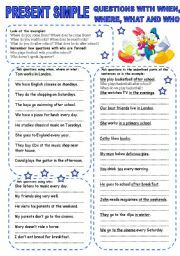 Great worksheet. Thanks a lot for sharing. Thank YOU Svetamarik, students need a lot of practice in this topic. 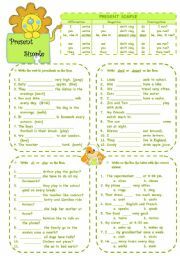 Another great worksheet! Thank you! I like your worksheets lot. Great and motivating! Thanks a lot! Very good! Thank you so much! 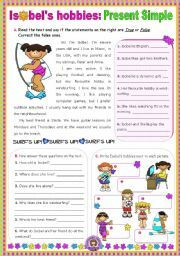 MY STUDENTS AND I LOVED THIS WORKSHEET. THANKS A LOT!!! GREAT JOB!!! 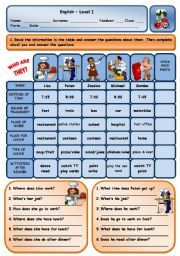 thanks so much for sharing this excellent worksheet! 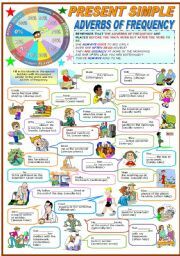 Thank you for sharing this wonderful worksheet. I am sure my students will enjoy it. It is very useful. That´s really wonderful and very useful! 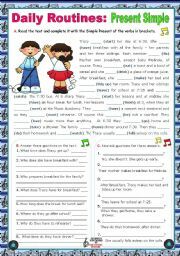 Thanks for those superb worksheets! thanks a lot. A very good ws. I will use it today. A great set. Thank you so much! Great! We never have enough of these! Thanks! 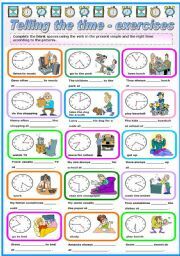 This is wonderful worksheet! Thank you so much! Great Work. Just what I was looking for. Thanks for sharing. Nice and a complete work. Thanks a lot!!! Great work! Not only a wonderful idea that children would love, but also a very well done layout and exercises. Great work. My kids really love it. what a wonderful work!!! congratulations and thank you very much! How to down load please. 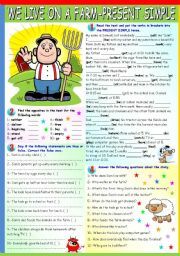 good worksheet I want to get this worksheet from this link but I can´t get it.. can you help me ?? 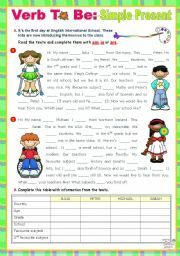 I want to get this worksheet from this link but I can´t get it.. can you help me ?? students & teachers will be benefited using this site. Thank you so much for sharing it! It is really usefull and my students loved it!!! This is a really comprehensive revision of the tense - and I love the illustrations. Thank you! Super! I really love it! 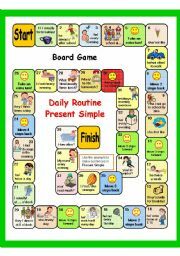 Yes, you are right when saying that there are lots of material with Present Simple, but the way you present it makes it appealing for students to learn it and practise more. Thanks a lot!! your worksheet is so great!!!!! how great!!!! I love it!! thank you! Thank you for sharing you fantastic work. Appreciate it! 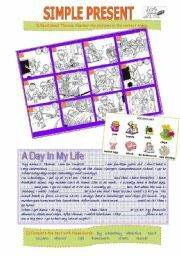 You don´t imagine how much I thank you .It´s a creative worksheet with a lot of details. THANK YOU SO MUCH FOR SHARING A FANTASTIC WORK! IT IS REALLY USEFUL AND DEFINITELY, I LOVE IT!!! Thank you so much for sharing! Just what I´m looking for! Thank you for your wonderful work. This is a very complete set of exercises! Well done. Thanks for sharing. Have a nice day. Thanks a lot for your worksheet. Thank you very much, colleague! I am glad to meet a fellow citizen here! Outstanding contribution, thank you very much, indeed!